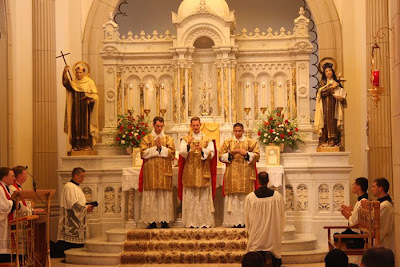 Iam non dicam vos servos sed amicos meos, quia servus nescit quid faciat dominus ejus. Alleluia. Vos autem dixi amicos, quia omnia quaecumque audivi a patre meo nota feci vobis. Alleluia. 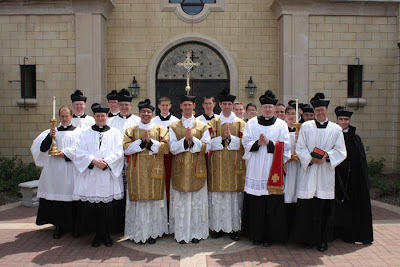 Last Saturday, the vigil of the feast of Pentecost, Melancholicus’ former classmates were ordained to the sacred priesthood of Jesus Christ by Bishop Fabian W. Bruskewitz in the Cathedral of the Risen Christ, Lincoln, Nebraska. Owing to personal circumstances, Melancholicus was unable either to be there or to assist at the First Masses of his friends. He has not yet received any photographs of the happy event but hopes to remedy this defect before long. Fr. Goddard will celebrate his first solemn Mass in his English homeland at 11am on 6 June (Saturday) in St. James’ church, Spanish Place, London. British readers of Infelix Ego in London and the south-east are encouraged to attend. Tell Fr. Goddard afterwards that Melancholicus sent you. He’ll be amused.